The product is a simple replacement fountain pen nib. It is perfectly functional, writes well and has the quality expected of Tombow. Where the pen company have excelled is in the service given. This product has taken a long time to come. Apparently The supplier had difficulty sourcing. Instead of leaving me hanging The Pen company has kept me informed of the issues all the way through. Despite it taking a long time I was content because they kept in touch, that is the way to handle a customer. I rarely experience this level of service today, Well done. El plumin es de acero igual que el original, pero la parte negra, de origen es metálica y en el recambio es de plástico, cambiando completamente en equilibrio de la pluma, haciendo mucho más pesada la parte de atrás que la delantera y haciéndola más incómoda de utilizar. Por suerte, la construcción interior es igual, por lo que con un poco de maña, se puede desmontar las dos piezas interiores y montarlas en la vieja. The nib is steel like the original, but the original black part is metal and the replacement is plastic, completely changing balance of the pen, moving the weight from the front to the back and making it uncomfortable use. Luckily, the inner construction is the same, so with a little skill, you can remove the two inner parts and assemble them in the old. I have a Tombow Object ball pen that I purchased probably ten years ago. I was excited when I discovered there were fountain pen upgrades for Tombows and I ordered one immediately. The service and speed of shipping from The Pen Company was exemplary. The nib and section, however, are otherwise. The section is exactly the right size to screw into the barrel of the old Tombow and looks to be the right length. However, the cap will no longer snap on. From what I can see, Tombow has changed the rib on the section from the old version to this new one and the new section cannot reach purchase on the cap. Very disappointing. So beware if you are upgrading from a ball pen. Apparently not all Tombow Objects are built alike. 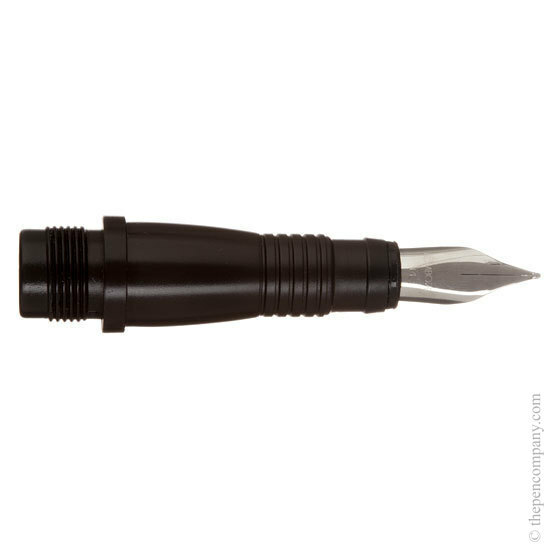 The nib unit is made as a replacement for fountain pens only, rather than an upgrade for a rollerball pen. The cap lining for the rollerball and fountain pen are different, to accept and seal on the section of the corresponding pen making them incompatible. I was pleased to find the product I required on line and was anxious to use it when it arrived, very promptly after ordering. However, the pen didnt seem to work well, it would write a little then stop again. I emailed the company for advice, and was told that after a period of non use I needed to flush through the unit with water. I did this and all is now working well - great to have my Tombo restored. So not only great sale and delivery but also the ability to contact with any problem. Having done that a prompt reply was given and all was well. Strongly recommend The Pen Company. I'm left-handed and finding a nib that works well for me is normally an expensive, time-consuming and sometime fruitless occupation. I have top of the range Pelikan pens but needed something for everyday use and was lucky enough to come across the Tombow Object pens at The Pen Company. I now run two of these with the OB replacement nibs which I find fabulous. Unlike many steel nibs, they take little time to run in and although just a little firmer than the gold Pelikan nibs I use, they represent far better value. They are also very easy to strip and clean. As always, the service from The Pen Company was courteous, accurate and fast. The nib section does come apart - but it does need to be correctly aligned to go back together. The nib sits on top of the feeder, there are two slight lugs that the back of the metal nib needs to 'hook' over these lugs. If you look at the opening in the grip section, you will see that one half of the circle is larger than the other - this larger section is where the metal nib will need to go, with the smaller part where just the feeder is. If you get it lined up it should just simply push in. Tombow only supply the whole replacement nib unit, rather than the bare metal nib. This makes replacement simple as the old front section can just be removed and replaced without having to take anything apart and reassemble.